My daughter and I walked over to the Lower Highlands Community Block Party last evening. 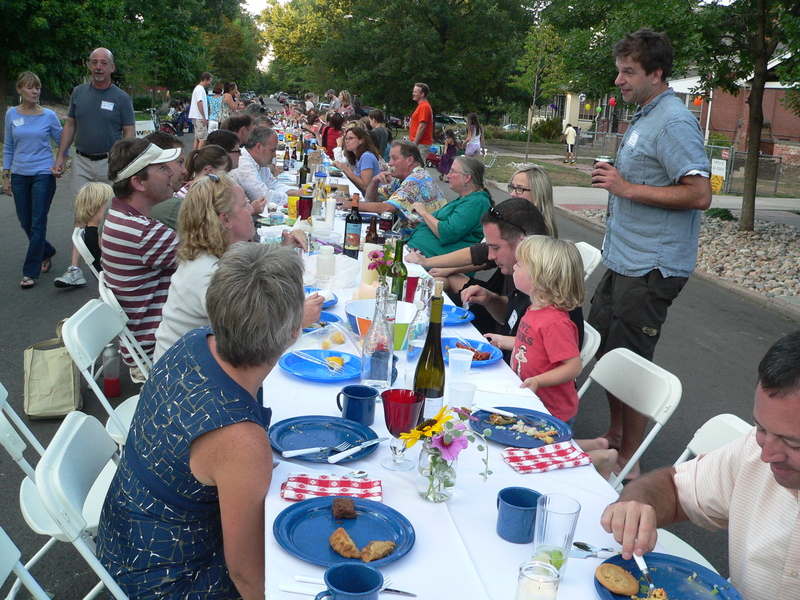 The late-summer weather was perfect for a gathering of neighbors. Tables draped in white linens lined up to form one long communal dinner table down Bryant Street. Flickering candles and simple flower arrangements created a welcoming mood. Neighbors mingled, many meeting for the first time, while music played, wine glasses were filled, and children laughed and made fast friends. At the north end of the street, Little Man Ice Cream, one of the party sponsors, set up their iconic bouncy castle, which is always a big hit among the young ones. Directly in front of the castle, girls giggled while mastering the skill of hula hooping. My daughter’s favorite activity was drawing with markers on the long stretch of paper rolled out along a sidewalk. After chatting for some time, we all sat down for dinner. Most everyone brought their own meals along with reusable dishes, cups, and utensils packed from home, as this evening was promoted as a zero waste event. Some people kindly brought food to share. Thank you to those who brought the grapes and the chocolate cookies, as they were a big hit with my daughter and myself. As the dinner was winding down and conversations were again flowing, the Little Man Ice Cream bicycle cart opened for business. They actually served their delicious ice cream (made from local ingredients!) to the crowd for free. I have to say I was expecting cones rather than the single-use plastic cups which were dished out at this party, but overall, it was refreshing to see so much waste averted during the evening. My daughter and I shared three scoops of lemon sorbet from the glass dish we brought from home. Yum! As the sun took its leave, so too did we. We said our goodbyes to new friends and headed home, me pulling a tired yet happy girl behind me in the wagon. Gallery | This entry was posted in Uncategorized and tagged Highlands, HUNI, Little Man Ice Cream, LOHI community block party, meet your neighbors. Bookmark the permalink.